← New Document: Centro Español de Tampa, Bodas de Oro, 1941. 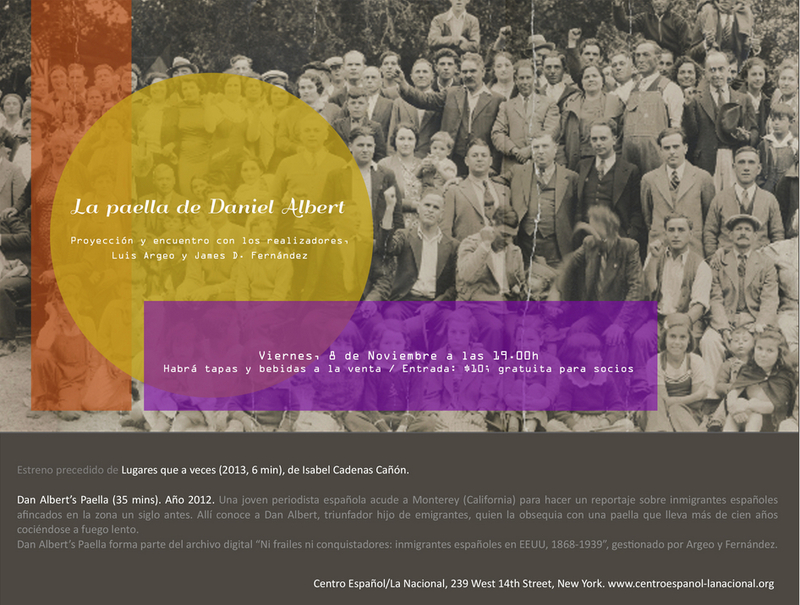 New York Premiere of “Dan Albert’s Paella/La paella de Daniel Albert”: Friday, November 8, 7:00 pm at Centro Español/La Nacional, 239 West 14th Street. We’re in the midst of a very busy and productive fall season. In just the last couple of weeks we’ve scouted locations and done preliminary interviews for “Todo el mundo a las Villas,” our project on the Spanish boarding houses in the Plattekill, NY area, and we’ve made a quick trip to Tampa to tie up some loose ends on the “Legacy of Smoke: Spanish Immigrants in Tampa” chapter. The Tampa film will most likely be premiered in Tampa in late April or early May, 2014. The NY premiere has garnered two nice write-ups in the Spanish press: El Comercio here, and La Nueva España here. Please join us on Friday if you’re in the New York area. And thanks for your interest and support. This entry was posted in Uncategorized and tagged Daniel Albert, New York, Tampa. Bookmark the permalink. I am booking my flight right now. See you on Friday. Jim, I visited “El Cortijo” in Platakill in the 40’s and have a photograph of the “Cortijo”. A descendant of Juan Pliego lives in Tampa. If you want to meet him on your next trip to Tampa I think I can Arrange it. Regards!